A cold front that swept into southeastern AUS on Tuesday 9 August presaged the most intense polar outbreak in decades for much of VIC and TAS. Snow was widespread in both states and southern NSW, with falls to sea level in VIC unprecendented in recent history, and many places reporting their first snow since 1986 or 1951. While falls were generally light, they were variable and a number of locations received enough snow to cause damage and dislocation. The strength of the outbreak prolonged the period of extreme cold. Many locations in VIC experienced their coldest August day on record on Wednesday 10 August and the cold airmass did not vacate the continent until Saturday 13 August. The broad area surface chart above summarises the exceptional synoptic situation that caused the outbreak. A ridge extends from the Great Australian Bight south into the Antarctic continent, with isobars on its eastern side showing a south to southwesterly airstream running all the way from polar regions to VIC and TAS. The animation at right shows the movement of the cold airmass. These charts are at 850hPa, about 1.5km up and free from any local effects of the land or water surface. 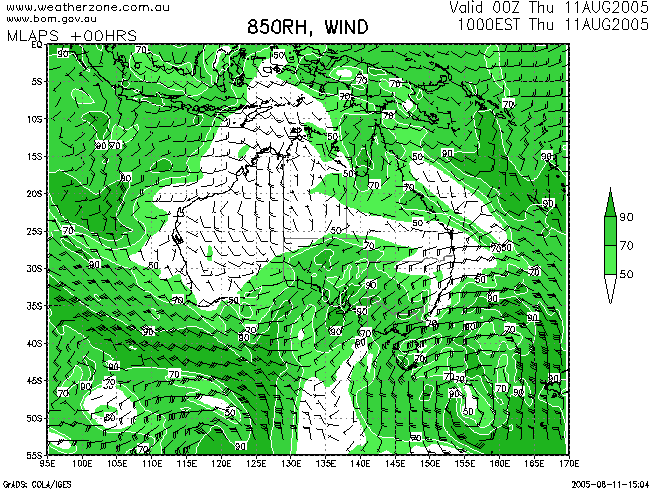 The wave of cold air moved rapidly northeast behind the surface cold front, covering half of VIC by 10pm Tuesday. The speed and depth of the cold air movement were a feature of this event, allowing the airmass to maintain intensity as it moved into warmer latitudes. Behind the front, a deep, unstable south to SW airflow set in, sweeping snow showers into the continent that retained their strength as they moved over land. By Wednesday evening, temperatures of -2 to -4 had invaded deeply into NSW, and snow showers were occurring on the Central and Southern Tablelands and the South West Slopes. 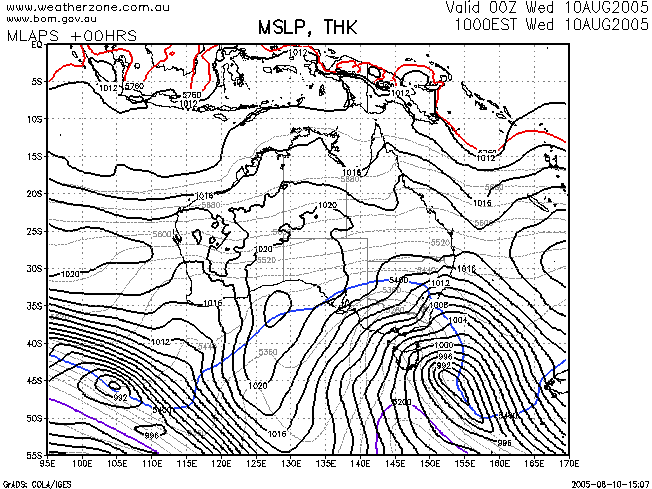 Charts have been taken from the Bureau of Meteorology MLAPS model, courtesy of Weatherzone. An exception is the 10am frame in the animation above which is from the GFS model and results in a slight irregularity in the animation. The charts are more fully discussed at left. Above: 12-hourly 850hPa (about 1.5km) animation from 10pm Monday to 10am Saturday. 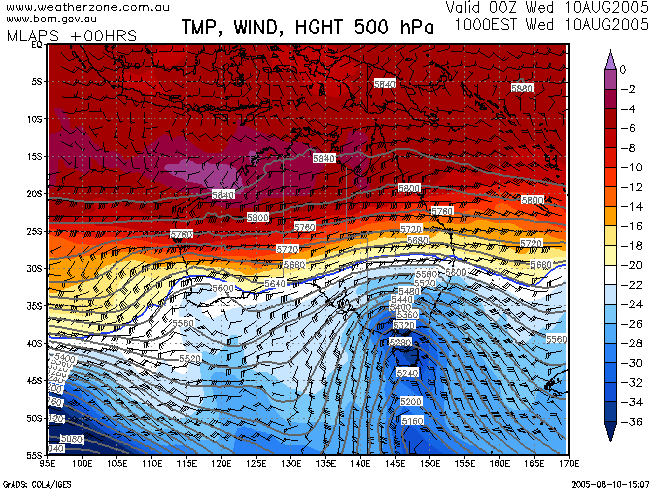 The 10am Wednesday 500hPa chart at about 5.5km shows the depth of the cold airmass. Temperatures over VIC as the thermal trough moved through were below -30. Both the Melbourne and Hobart radiosonde balloons reported -33 at 9am on Wednesday. This is about 9C below the August average for Melbourne and 7.5 below for Hobart. 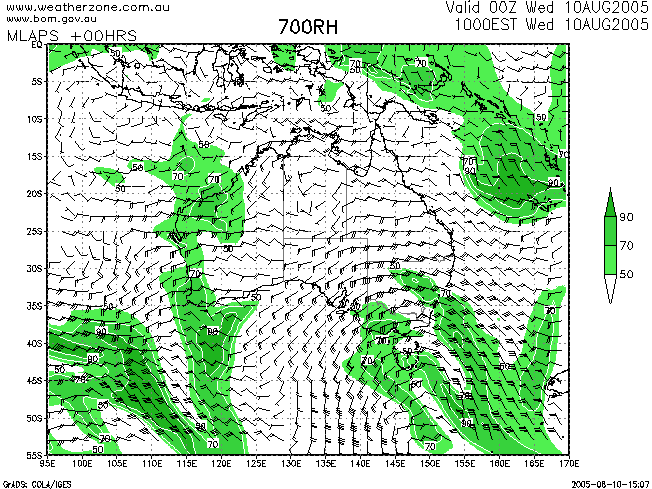 Of interest is the small trough over SW WA. This moved east on Wednesday and on Thursday was captured by the main circulation which had moved into the Southern Tasman. The effect on the secondary trough was like a sling-shot, and during Friday it moved rapidly NE across western NSW and southern QLD. This second wave of cold upper air helped prolong the cold spell and extend it into QLD. On Tuesday evening, with the approaching cold air producing a strong temperature gradient across SE AUS, and the upper trough providing strong vorticity or spin, a surface low formed just SE of Hobart. By the time of this surface chart at 10am Wednesday it had deepened to 989hPa and was moving slowly SE. With a ridge of 1020hPa arching around the low from SA to southern QLD, a strong pressure gradient whipped up strong to gale force winds which brought blizzard conditions in mountain areas, storm force gusts along the coast and high wind-chill effects right across the southeast. The dotted thickness lines on the chart show the severity and depth of the cold snap. They measure the thickness in metres between the 1000hPa and 500hPa pressure levels in the atmosphere; the colder and denser the air, the less the thickness. As a very rough rule of thumb, the 5400 line (shown in blue) is generally reckoned in Australia as the boundary of air cold enough to produce snow down to around 1000m. Thicknesses reached 5240 over southern VIC and nearly 5200 across TAS during Wednesday, while those on the Central Tablelands of NSW dropped to around 5300 on Wednesday evening. The jetstream, shown here by the wind barbs at 300hPa (about 9km), is solidly southerly, from off the edge of the chart at 55°S to the VIC coastline. Core speeds are around 100 to 120km/h. Very high instability is present over TAS and central southern parts of VIC in this snapshot at 10am Wednesday. This coincided with some of the heaviest low-level snowfalls in both states. The highly unstable area moved east during Wednesday, leaving the whole southeast in a broadly unstable southwesterly stream. Humidity levels were not particularly high during this event. Many reports of snow away from the Alps indicated light falls with accumulations of perhaps 2 to 5cm, equivalent to 2 to 5mm of melted precipitation. 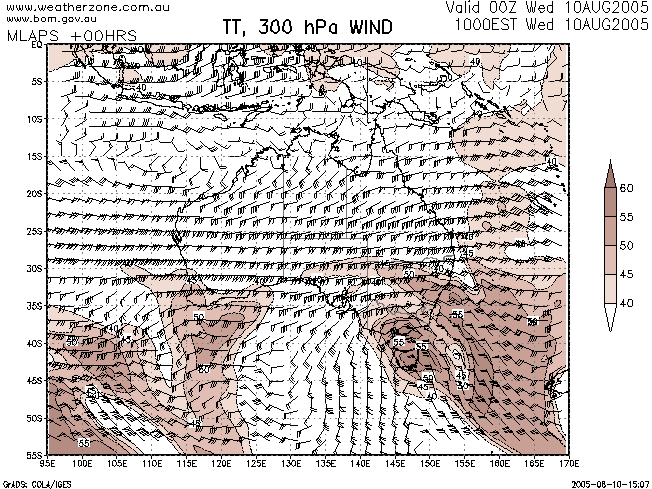 Significant mid-level moisture shows up on this 700hPa humidity chart (about 3km). Once again, this 10am Wednesday snapshot shows good moisture levels over VIC and TAS, coinciding with high instability and the heaviest reports of snow. This area of moisture was borne rapidly east on the strong westerlies, clearing the continent by Thursday morning though it lingered longer over southern TAS where the heaviest snow fell on Thursday. After this time, mid-level moisture was insignificant. The 850hPa humidity chart for 10am Thursday shows that although the mid-level moisture may have cleared away, there was still significant if patchy humidity at lower levels. Scattered showers marching NE across central VIC during Wednesday night harnessed this moisture to maintain their strength, reaching as far north as the NSW Blue Mountains. This low-level humidity also produced widespread light snow grains (virtually a frozen drizzle) on exposed upslopes. Of note is the dry slot east of the Great Divide on the NSW coast where descending winds result in warming and drying out of the air. Snow began falling in Alpine areas late Tuesday behind the front, then descended to progressively lower levels overnight into Wednesday as temperatures approached zero over much of southern VIC. By mid-morning, snow was falling over a broad area of central southern VIC with many falls reported at sea level. The heaviest sub-Alpine snow fell in the Strzelecki Ranges and around the Latrobe Valley southeast of Melbourne, while light snow showers were reported from much of the West Coast and Western District. During the day, the snow turned to snow showers with some heavy falls moving into the northeast of the state. Perhaps the most remarkable feature of this event was the widespread falls of snow to sea level with snow reported on beaches from the Gippsland Lakes district to the Great Ocean Road. Senior Forecaster Scott Williams at the Bureau of Meteorology said "the most unusual and notable thing about this is the fact that it snowed right down to the beach in parts of central Victoria and Gippsland." Snow was reported lying on the beach at Inverloch, and was observed falling along the coast at Wonthaggi, Rhyll and the penguin reserve at Phillip Island, on the Mornington Peninsula, at the southern Melbourne bayside suburb of Seaford, at Geelong, and along the Great Ocean Road at Torquay, Ocean Grove, Lorne and Apollo Bay. The most recent reports of snow at sea level in VIC were on 20 July 1951. Light snowfalls were also reported from Melbourne's northeastern to southeastern suburbs, the first since flurries were observed across much of Melbourne on 25 July 1986. Heavier falls were reported in the Dandenongs. There were significant snowfalls and accumulations in the Strzelecki Ranges and around the Latrobe Valley from a band of heavy precipitation that moved across the area late morning. The highest rainfall totals in the nation for the 24 hours to 9am Thursday were in this region and included 45.2mm at Mirboo North, 38.8 at Koornalla (10km S of Traralgon), and 33.4 at Leongatha. Much of this would have fallen as snow during the Wednesday morning episone. The Principal of Mirboo North Primary School, Alistair Hillis, said "There's about 16-18cm [on the ground], the thickest I've ever seen down here. We haven't had snow like this since '77 and even then we didn't close the school or the roads or anything." The school was closed as the heavy snow came down soon after students had arrived sparking fears that 120 students from outlying areas would not be able to get home, though by late afternoon they had. One farmer in the area reported snow up to 60cm deep. VicRoads closed main roads, including parts of the South Gippsland Highway and Strzelecki Highway as well as many secondary roads, while graders were brought in to clear some roads. A resident dressed as Santa bodyboarded down the main street of Korumburra. In the Latrobe Valley, longtime residents of Morwell and nearby Churchill, which are about 100m above sea level, said the snow was the heaviest in their memory with one farmer near Thorpdale telling ABC radio it had been snowing on and off for 12 hours. The snowfall unfortunately coincided with early lambing and calving, forcing farmers to bring freshly born stock indoors and causing many deaths of beasts born in the snow. On the Monash University Gippsland Campus at Churchill, 10km south of Morwell, snowball fights erupted in the corridors. On the valley's northern side, two ambulances taking an injured skier to Warragul Hospital were trapped in blizzard conditions on the Mt Baw Baw Tourist Road for 3 hours. They and several cars were stopped by fallen trees and debris on the way down the mountain, and could not return to Mt Baw Baw as other trees had fallen over the road while they were stopped. SES volunteers cleared over a dozen trees to free the vehicles. Snow settled thickly on higher parts of the southern Mornington Peninsula. A Red Hill resident told ABC Radio "It really looked lovely. It snowed for probably 15 or 20 minutes, then went away as quick as it came." Snow accumulation in the Otway Ranges made roads treacherous, cut powerlines and closed the Lavers Hill P-12 College for the day. In the state's northeast, Stanley, 7km SE of Beechworth, was blanketed in white after snow flurries settled on the ground just after lunchtime while heavy falls in Beechworth lasted for about an hour from 3pm. Two people were killed when their car skidded off the icy Beechworth-Wangaratta Road at Black Springs about 6.20pm. Snow was also reported from Edi Upper in the King Valley, 365m asl around the middle of the day. Snow fell to low levels in the state's west, though reported falls were light and in many cases did not settle. There were also widespread showers of hail and soft hail, also known as sago snow. Snow was reported in the press and on weather fora at Mt Macedon, the Grampians, Winchelsea, Heywood, Hamilton, Wannon, Ballarat, Trentham, Daylesford, Tylden, Kyneton, Camperdown, Colac, Garvoc, Timboon, Woorndoo, Mortlake, Ballan, Lal Lal, Hawkesdale and Dunkeld, and in and around Ararat including Yalla Y Poora and Willaura. Snow was 8cm deep around Penshurst (250m asl) closing the road to Mount Rouse. Heywood experienced a heavy fall of soft hail around 8.30am, covering some roads to a depth of 7cm, while a heavy hail storm in Warrnambool during the morning caused several vehicles to come off roads. An assiduous Warrnambool Standard reporter researched previous snowfalls and wrote: "On June 23, 1981 Camperdown, Mortlake, Noorat and Terang were left with snow cover several centimetres deep in places. According to The Standard's reports at the time, it was the district's first heavy snowfall in 71 years. Last year snow covered Mount Abrupt near Dunkeld and in 2000 snow fell around Casterton and Hamilton." Mt Hotham's -6.7 appears to have set a new national record low maximum temperature for August and the second lowest maximum temperature for any month. The lowest maximum temperature on record was set at Thredbo Top Station on 9 July 1978 when the mercury didn't rise above -6.9. The previous lowest maximum temperature at any of the three sites that have been located on Mt Hotham was -5.9 on 9 August 2003. Other low maximum temperatures have been Perisher Valley -6.0 (26/06/1983) and Thredbo Village -6.2 (02/07/1975). Many other locations broke their previous August low maximum temperature records on Wednesday 10 August as shown in this table from the Bureau of Meteorology. By Thursday morning, a heavy snow cover in the Strzelecki Ranges remained a problem while black ice caused traffic disruptions in many areas. It took 4 hours for a snow plough and emergency workers to clear deep snow and fallen trees so as to rescue a 98-year old man who had collapsed in his house at Balook, 25km km south of Traralgon. Ambulance officer Garry Hodson said "We've never encountered snow like this before in this area". Slush from the thaw in the Strzeleckis caused havoc on local roads as council and emergency workers struggled to clear snow and tree debris. The main Neerim Road, Boolarra Road, Boolarra South to Mirboo North Road and Tarra Valley Road were all closed for part of their length. Cancellation of school bus services meant that only one-third of students attended Mirboo North Primary School. The Tarra Bulga National Park was closed, with downed trees making driving and walking dangerous and many of the tree ferns for which the park is famous badly damaged by the heavy snow. Melting snow and black ice caused many minor collisions across the state, with the worst affected areas being Geelong, bayside areas and the outer eastern suburbs of Melbourne. VicRoads said black-ice warning systems were activated on the Calder Highway between Macedon and Kyneton, and reduced speed limits or advices were in force around Castlemaine, Daylesford, Woodend, Myrtleford and on the Great Alpine Road. In Melbourne, the unusually cold weather resulted in a massive jump in the number of people suffering respiratory problems, the ambulance service reporting 86 calls between 5pm Wednesday and 10am Thursday. Snow fell as low as 100m on Wednesday, but the heaviest snow episode was on Thursday when precipitation from an area of mid-level moisture coincided with temperatures cold enough to allow snow to settle on beaches in the south. The snow caused major disruption in the south, west and central parts of the island with many major highways closed, some for up to four days. In Hobart on Wednesday, the temperature fell to just 4C at 1pm with snow falling in the higher suburbs such as Mt Nelson and settling down to 300m on Mt Wellington. Farther south, it settled to 100m at Geeveston, and was reported settling at Collinsvale, 10km west of Hobart, and in the Huon Valley, on Bruny Island, and at Eaglehawk Neck close to sea level on the Tasman Peninsula. Heavy falls in the west of the state isolated West Coast towns from the rest of the state and from one another. Police closed the Lyell Highway between Derwent Bridge and Queenstown, the Murchison Highway between Fingerpost and Rosebery and on to the Henty Main Road intersection, The Queenstown to Strahan Road, the Strahan to Zeehan Road, the Cradle Link Road and the Ridgley Road from Hampshire to Fingerpost. Especially heavy falls were reported around Hampshire. Many tourists were stranded, especially in Queenstown (191m asl), but a snowplough helped a four-wheel drive ambulance transport three women in labour to Burnie Hospital by clearing a way along the Murchison Highway. The heavy West Coast falls rekindled memories of the snowstorm of 9 August 1951 when snow had to be shovelled from the streets of Queenstown. One measure of the coldness of this airmass was the maximum temperature of 5.0C on Wednesday at Maatsukyer Island, just off the TAS South Coast. This was the island's lowest August maximum in 48 years of computerised records, and equalled its lowest all time readings of 29 September 1959 and 28 June 1983. From about 4am Thursday, the weather deepened in SE TAS, with snow beginning to accumulate to sea level. Snow fell in central Hobart for the first time since 7 August 1994 but did not settle. The snow settled down to the 100m level in Hobart, but settled to sea level 10km to the south, with snow reported on Kingston Beach and the beach at Blackmans Bay. Snow to sea level covered Bruny Island, the Huon Valley and Tasman Peninsula. Press reports of snow depths included 5cm at Taroona, 10cm at Franklin and 30cm on the Gordon River Road. Dozens of roads were closed or accessible only to four-wheel drives. The main Southern Outlet, Channel Highway and Huon Road into Hobart were closed from about 7am to 10.30am, delaying thousands of commuters to Hobart. Twenty-five schools were closed, affecting 6,500 students, with another 2,000 students unable to reach schools because of closed roads. The major Tahune AirWalk attraction near Geeveston was closed, and travellers to Port Arthur from Hobart could not set out until a thaw set in late morning. Snow in SE TAS seems to have been the heaviest since 25 July 1986 when most main roads in Hobart were closed and the city isolated until almost noon. Mount Wellington's maximum of -5.0 on Thursday was its lowest August figure in 24 years of record and equalled its all-time lowest maximum (and also the state's record low maximum) set on 5 September 1995. On the West Coast and Central Plateau, most roads remained closed on Thursday, with the Lyell Highway between Derwent Bridge and Mt Arrowsmith not reopening until Saturday. Even then, the Lake Dobson Road, Waratah Road, Olivers Track, the Cradle Mountain Link Road and the Anthony Link Road were open to four-wheel drive vehicles only. A bonus from the snowfalls, however, was the opening of the marginal skifields on Ben Lomond in the state's northeast. They reported 35 to 45cm of powder snow at the base of their four lifts, with deeper snow higher up. Snow began falling on the NSW Central and Southern Tablelands and South West Slopes on Wednesday morning, though accumulations were generally light and above 1100m. About 4cm of snow was reported on Mt Canobolas and at Nashdale near Orange by the afternoon, and snow was falling intermittently in the Yetholme area between Bathurst and Lithgow, around Oberon, the Blue Mountains and at Tumbarumba in the south. South of Oberon, the Edith, Abercrombie and Gingkin Roads were closed. Late afternoon, snow fell across Queanbeyan and during the evening fell heavily enough at Sutton (about 600m asl), 20km NE of Canberra, to cover the ground. Light snow accumulated on the ground at Towrang, 620m asl and 15km NE of Goulburn, and settled snow was observed still lying around Gunning, also 620m asl and 40km W of Goulburn) late on Thursday morning. Overnight into Thursday, temperatures along the Southern and Central Tablelands dropped further treating many areas above about 600m to very light but continuous falls of small ice crystals where the available low-level moisture was forced upslope. As mentioned in Why it happened above, some showers in the southwesterly airstream also maintained their intensity unusually well as they moved up the western side of the Great Divide into the Central Tablelands, one of these crossing the Blue Mountains between Medlow Bath and Mt Victoria and dropping 3 or 4cm of snow. This, and black ice forming on meltwater from earlier falls was enough to close the Great Western Highway for about 12 hours overnight. A semi-trailer that jacknifed on black ice near Medlow Bath at about 9.30pm further delayed efforts to reopen the road on Thursday morning. In the area around and south of Oberon, 10cm of snow with drifts to 30cm accumulated overnight, isolating the town for a while on Thursday morning. Snow was 6cm deep in the town, and snow and hail also blanketed lower country to the north around Tarana and Sodwalls, and to the west around Blayney. Although skies cleared on Thursday, the airmass over the Central Tablelands was still cold enough for whole hillsides sheltered from direct sunlight south of Oberon to remain snow covered until late Sunday or Monday. Oberon's minimum and maximum temperatures from Wednesday to Sunday were 1.4/1.4, -5.1/0.4, -5.6/4.1, -5.8/11.1 and -2.7/12.1. As a postscript, hundreds of Lithgow residents were left without a water supply on Saturday morning as pipes froze or burst in the lowest temperature recorded for at least 5 years. The official reading was -6.0 but Lithgow ambulance vehicles registered as low as -9 in the Marrangaroo area about 5am. Orange Agricultural Institute set a new record low minimum temperature of -5.0 on Friday in 30 years of record. Glen Innes nearly reached double negative figures the same morning with a low of -9.9, while the Hunter Valley also experienced an unusually cold August morning with readings of -3.4 at Cessnock Airport (a 13-year record) and -2.5 at Cessnock (Nulkaba). Snow and sleet showers fell around Canberra on Wednesday afternoon and early evening with scattered heavier showers producing light accumulations in some higher areas. A procession of moderate to heavy showers moved across Canberra's northern suburbs and the country as far northwest as Yass between about 3 and 8pm, with snow settling to about the 600m level. Late afternoon, ABC Local Radio was reporting heavy snow falling to the south and SW of the city. Gavin O'Brien of ACT's Southside Weather Watch said "I drove into it on the Monaro Hwy around Hume. It was blowing across the road almost horizontally, so heavy at times it was hard to see. Snow was lying on the ground up to 3cm deep in drifts near fences, thicker on the hills from Hume though Chisholm and Gilmore" about 15km south of Canberra CBD. He said the temperature at Gilmore fell from 7C at 3pm to 0.2 at 5.45pm and remained around zero all night though snow stopped about 6pm. "Snow was still lying on the ground and roofs around us as late as 10 o'clock [Friday] in sheltered areas. It's the longest snow has lain at our level (660 m asl) since we moved here in 1991," he said. On the Brindabellas to the west, heavy snow still remained on the ground about the 900m level on Friday. Snow fell for a short time at Springbrook, inland from Coolangatta on the McPherson Range at 980m asl. It settled briefly on metal surfaces and some ground before melting. Monto 9.9C, coldest day in 32 years of record. Baralaba 10.8C, coldest day in 36 years of record. Gympie 11.8C, coldest day in 40 years of record. Rockhampton 12.8C, coldest August day in 67 years of record. Nambour 13.9C, coldest August day in 41 years of record. Applethorpe 7.0C, coldest August day in 37 years of record. Oakey 10.2C, coldest August day in 33 years of record. This snow event dumped between 40 and 70cm across the Victorian and NSW Alps from late Wednesday to Friday, with blizzard conditions and very low temperatures even by Alpine standards prevailing for most of the time. The temperature range at Mt Hotham was -7.9 to -6.7 on Wednesday and -8.8 to -5.0 on Thursday. With low temperatures resulting in a fine, dry powder snow that is fairly rare in Australia, one snowfields commentator enthused: "This amount of snow cover is going to give skiers an unbelievable powder day, in fact it's safe to say this would be as good as it gets." Icy conditions on Wednesday night, however, caused about 20 vehicles to slide off Alpine Way between the national park gates and Thredbo. Police and tow truck operators took over an hour to clear the road.